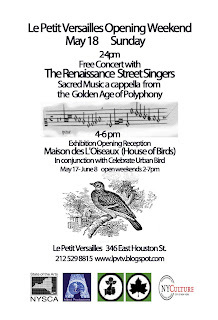 Le Petit Versailles Opening Weekend & More! 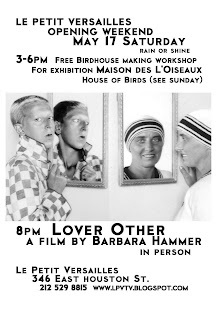 | Allied Productions, Inc.
8pm – Lover Other- a documentary by Barbara Hammer -in person. “To mirror, to fix, these are the words that have no meaning here”;?Under the mask is another mask, I will never finish lifting all these faces”. ?Claude Cahun, Aveux non avenues These words are from the 1930 anti-autobiography by the Surrealist writer, photographer, Resister, and lesbian, Claude Cahun, born Lucie Schwob (1894-1954). LOVER OTHER is a 55 minute documentary that tells her story as well as that of her partner and lover, her half-sister, Marcel Moore, born Suzanne Malherbe (1892-1972). Visuals and voiceovers will bring art, politics and gender identity to the fore as I continue my investigation into artists and Resistance during WWII. Finding an unpublished script in their archive, I decided to bring it to life and cast Kathleen Chalfant (Broadway star of Wit and Angels in America) as Cahun and Marty Pottenger (performance artist) as Moore. Timesplat – where the past and the future collide in the classic tale of chaos. Featuring a performance by the timeless Kenny Scharf, video installations by Inbred Hybrid Collective, and analogue music by artiste extraordinaire Scott Ewalt. Sport your space cowboy look or your Neanderthal drag. Inbred Hybrid Collective was established in 2005. Our mandate is: to stimulate a consciousness of the external factors affecting our human existence. The type of interventions associated with Inbred Hybrid Collective, achieved as artistic concept, constitute a provocation for the public to reflect upon the influence that this immersion has had upon them. Inbred Hybrid Collective presents two installations. ART STAR TREK, a multi-channel science fiction installation. Reliquarry, a multi-channel installation, documents one cave man’s return to the lost city Bedrock. Scott Ewalt had his first gig at the tender age of eighteen. Webbed feet mono-analogue troglodyte, he remains supersonica. Mobility – Confabulation on the Experiential Nature of Modern Medicine is about the nature of our interlocking set of experiences with medicine and what it means to live with ongoing chronic, episodic medical issues. Hearing is a very simple ‘musical’ installation. The micro simply captures the environment sounds and through the mixer send all directly out to the headphones (that is to people’s ears), so that the listener can hear quite exactly the sounds he would have heard normally, without the earphones. Accordion Angels: Bob Goldberg; Carl Riehl; Genevieve Leloup; Mark Nathanson . Accordion Angels is a newly-forned accordion quartet, that bridges the traditional and the post-modern. -vintage instructional, excersise and self help videos.